You may find yourself faced with a slightly new way of managing files on your Surface. In older versions of Windows, a program named Windows Explorer lets you view your computer’s files and storage spaces, shuffling files between them as necessary. Windows Explorer lives on but with the new name of File Explorer. And true to its predecessor, File Explorer also lets you manage your Surface’s files, folders, and storage areas. That makes the program particularly handy for moving files on and off your Surface. Open the Desktop app with a tap on its Start screen tile. Tap the File Explorer icon (shown in the margin), found on the left end of the desktop’s taskbar — that strip along the desktop’s bottom edge. File Explorer appears, letting you manage the files on your Surface. To see your Surface’s storage spaces and the files inside them, tap This PC from File Explorer’s left pane, called the Navigation pane. There, you see all the storage locations accessible by your Surface: its internal hard drive, removable memory card, network locations, and any storage you’ve plugged into its USB port (including flash drives, portable hard drives, and even digital cameras). To see inside a storage area, tap it on the Navigation pane. Tap any storage area you see, and File Explorer lists the files stored inside. For example, tap any of your Surface’s main storage areas (your Documents, Music, Pictures, and Videos folders) to see their contents. You can also tap your Surface’s memory card, or icons for any flash drives, or portable hard drives. You can even see photos stored on a camera you’ve attached with its USB cable. 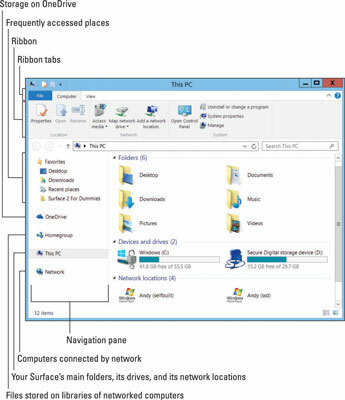 When you want to copy or move files or folders from one place to another, Windows makes you take two steps: First you select the items; second, you copy or move them to their new location. Although desktop windows contain scroll bars, it’s hard to position your fingertip inside those narrow bars. Instead, slide your finger up or down directly inside the Navigation pane; that scrolls the pane’s contents up or down. The same applies to the items you see in the File Explorer window’s left side.